I hate to admit it, but the very first Frenchman I met ended up thinking that I lack manners. He seemed to get disappointed every time I opened my mouth, and it wasn’t my inability to speak proper French that bothered him. It was my ignorance of French social code that made our encounters more frustrating day by day. I never thought I was doing something wrong. (Well, maybe I messed up some conjunctions, omitted subjunctive here and there, and commited a number of other typical French mistakes). But, in reality, I made probably all possible faux pas that a learner of French can slip on in a conversation with a native Frenchman. And I would remain the most tactless interlocutor in the French world if I never came across one book. It was The Bonjour Effect. This book opened my eyes on the subtle cultural differences that I had no idea existed. It also helped me to fix relationships with that Frenchman (who, by the way, was my prof… of French). Here are five major things I learned. Out of all French mistakes you can ever make, this is a grave one. Grave, because if, God forbid, you ever skip saying bonjour or say it the wrong way, you die in the eyes of your interlocutor. For French, the “Bonjour Exchange” is primordial. As Julie and Jean-Benoit, the authors of the Bonjour Effect, remarked, “If you don’t say bonjour, you don’t exist“. And as I realized from my own painful experience, it is very very true. In France, one often says, “c’est si simple comme bonjour“. It means “nothing can be easier”. Such a metaphor already alludes that the French consider bonjour simple, automatic and habitual like brushing your teeth after breakfast. However, if only things were as simple as Frenchmen like to think! First of all, no matter how automatic your bonjour is, it still has to sound like a sincere and respectful greeting. In other words, you have to mean it. Moreover, saying bonjour in the first place doesn’t yet give you the right to continue. You have to hear a bonjour in return. And this is probably the most frustrating part for North Americans who prefer to cut to the chase with the usual “Hi, can I get…“. This “Bonjour, Madame”, of course, sounded like a mockery. Because it meant only one thing: that my professor had to start her speech over. Don’t expect natives to be forgiving to these French mistakes. Say bonjour first. What can be wrong with asking someone’s name, you might think. It is quite natural to throw in a casual, “hey, what’s your name?” after exchanging a few phrases with a stranger, right? However, if you deal with a Frenchman, this innocent question may be conceived as an interrogation. And there’s a deep-rooted cultural reason behind it. Julie and Jean-Benoit explain this French peculiarity in terms of “bubbles”, or social spheres. There are different levels of social relationships that entail different levels of interaction. The “public sphere” is open for anyone with whom a person wishes to communicate. The “personal bubble” is more restricted. And the “intimate sphere” includes but closest friends and family. And it sounds pretty universal, right? But don’t be misled. One of the biggest mistakes French learners make is thinking that these “bubbles” work similarly in different cultures. French won’t discuss personal matters with a stranger. They won’t share their life story. They also won’t reveal their name. Because names are the attribute of the personal bubble; they are not for use in public. That’s why for French, it’s very normal to exchange their views about the world and depart without getting to know comment vous vous appelez. And I actually find it very appealing. Tell me, how many times you forgot someone’s name after a brief introduction and then felt awkward for the rest of the conversation? If everybody did like Frenchmen, we would be a much happier society. French vous is another element of that ubiquitous Social Code that can be barely explained in words. It’s a nightmare that will never let you go. Good news is that you are not alone here: this tu/vous distinction is a source of headache even for natives themselves. Language schools typically teach students to play safe and use vous as a default option. And it’s a good habit, which, nevertheless, doesn’t protect you from slipping on this typical French learner mistake. I’ve seen a lot of immersion students, here, in Canada, addressing me with vous, despite us being of the same age and taking the same courses. It has driven me crazy. As a speaker of Russian (which also has the tu/vous distinction), I can’t help but perceive this vouvoiement as an attempt to create a distance and restrain relationship. Same true for French. Vous is indeed a way to mark the distance. It can be a distance in age and rank or, worse, a perceived distance in age and rank. This is a way to show respect and formality (if not solemnity), which is, again, used mainly in the public sphere. Tu is a more relaxed form. However, it means more than simple familiarity or equality between two people. Rather, it is a way to encode common membership. So, for example, graduates of the same university, despite their difference in age, would still tutoyer to each other simply because they share alma-mater. And if it caught you at surprise, you are not alone. Clearly, each language seasons their tu and vous with something special (just to see your suffering). “So what do you do?” is typically among the first few questions that North Americans pose to new acquaintances. But it’s probably among the last topics you want to discuss with a recently met Frenchman. Remember the social “bubbles”? Well, topics such as family, work and money would, again, be a part of the personal rather than the public sphere. As Julie and Jean-Benoit discovered during years spent in France, broaching such subjects unavoidably puts the end to a discussion. However, if Frenchmen themselves start telling you about their work and family, it is a good sign. It means that they offer you their friendship. But until then, what do you talk about? Well, take the lesson from the French themselves. Discuss ideas, show off your wit or even argue. As my yet another French prof pointed out, French is probably the only nation who argues just for the sake of a debate. No usually means no. The message is clear: the conversation is over. In France, it is a camouflaged oui. 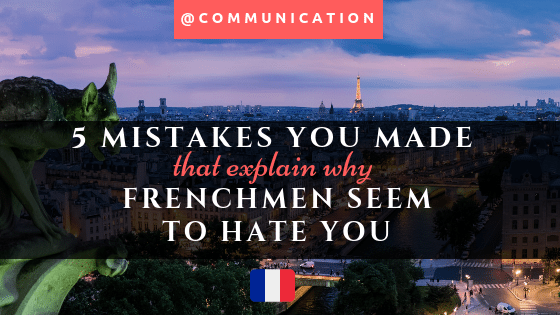 Taking this non as a definitive answer is among the biggest French mistakes learners make. If you stick to this habit, you won’t get far in France. Actually, you won’t get anywhere at all. Instead, it’s almost always worth trying to bargain. As long as you keep talking and put interesting arguments on the table, there is a chance to turn this non into oui. The more eloquent you are, the higher your chance to win the battle. This point is beautifully developed in Le Brio and other French movies. What else can you expect from people who won’t acknowledge you until you open your mouth? For a Frenchmen agreement is a stalemate. Conversations don’t start with an agreement. Neither do they end with one. The point of French conversation is to be interesting. And that’s what you want to stick to at all costs. 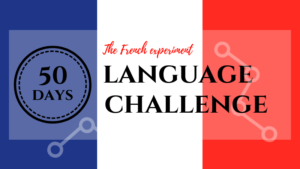 How to avoid these and other French mistakes? I think the best part of learning a language is that you can see the country’s culture through the language. And it gives you different levels of understanding of that culture when you really try to dig in and learn it. For me, learning a language doesn’t end with knowing how to speak it. Learning the culture that expresses itself by means of this language is a more appropriate goal. 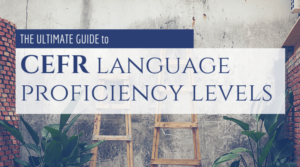 There is no point of learning French if every conversation with a native speaker leaves you with an array of negative feelings. French Conversation can be an unforgettable experience. But as I learned, it’s also something you want to be prepared for. So if you’re a learner of French, a fan of French culture or just a free soul heading to Paris next week, reading this book can be one of the best decisions you ever made. 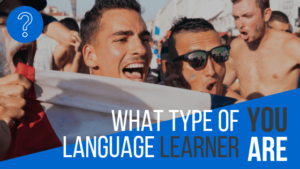 What Type of Language Learner You Are?